We are able to offer full boat workshop facilities including general maintenance, repairs and even narrow boat hull extensions should you desire. We also offer a complete paint service in our undercover dock. All our engineers are experienced on most types of boats and offer engine, electrical and Calor Gas servicing to B.S.S specifications. Our slipway can accommodate up to a 70ft boat together with hoist and cradle facilities. We can also provide a blacking and high power wash cleaning service to the hull of your boat. 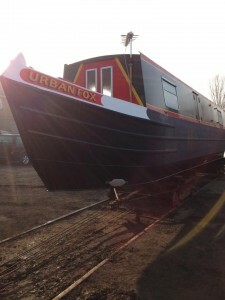 Full narrowboat repainting includes sandblasting superstructure & pressure wash with bottom blacking, 2 primers 2 undercoats and 1 gloss using International Paints. Maximum of 3 colours included in the price.